The metropolis today gave a warm but chaotic civic reception to Sourav Ganguly for his outstanding performance in the Test series against Pakistan. “Batting lower down the order in the past denied me several centuries,” said Sourav Ganguly, who felt VVS Laxman too had “suffered” in terms of scoring hundreds because of batting at number six. Looking back at Pakistan’s 50-day tour of India, one is certainly forced to admit that the hosts came out on top in virtually every department. They first won the one-day international series and then went on to take the Test series too. It was for the first time in 21 and 27 years, respectively, that a Pakistan team touring India have lost an ODI and a Test series, and somewhere this dismantling hurts. England’s batsmen shone under pressure to draw the second Test against Sri Lanka here today and keep their hopes alive in the three-match series. The tourists, needing to bat out the fifth day after trailing by 197 runs on the first innings, played solidly to move to 250-3 in their second knock by tea before rain washed out the final session. Cricket Australia is well on course to introducing a revolutionary and untouched idea of day-night Tests. “A mess-up on the last hole cost me the Golf Nippon Series JT Cup,” said Jeev Milkha Singh as he talked about the double bogey folly on the 72nd hole in the last event on the Japan PGA Tour. Force India may not set alight the circuit with the present car but Vijay Mallya, co-owner of the Formula One team, has set the outfit the target of a podium finish when India hosts its first Grand Prix in 2010. Odafe Onyeka Okolie’s hat-trick propelled Churchill Brothers to a 3-2 win over East Bengal in the ONGC I-League at Nehru Stadium, Margao, here today. Lyon and Fenerbahce won their final group games to capture the last two spots in the knockout round of the Champions League. Defending champions Indian Air Force (IAF), New Delhi, had to fight hard to record a close 3-2 victory against Mughals Club in the Delhi Soccer Association Senior Division League at the Ambedkar Stadium here today. World chess champion Viswanathan Anand and World Cup archery gold medallist Dola Banerjee have been sanctioned Rs 10 lakh each for their outstanding achievements in 2007 by the Union Ministry of Youth Affairs and Sports. Maharashtra defeated Sashashtra Seema Bal (SSB) 7-3 to enter the quarterfinals of the 56th All-India Police Hockey Championship at Olympian Surjit Hockey Stadium here today. Several thousand admirers of the Prince of Kolkata gathered around the open stage at the Millennium Park on the banks of the Hooghly, as West Bengal’s ministers sang paeans to the cricketer. The venue soon seemed too small to accommodate the large crowd which poured in from the city and neighbouring districts. The organisers’ failure to make proper arrangements for the media added to the chaos. A large number of people returned home disappointed as they were unable to catch a glimpse of their favourite cricketer, who was adjudged Player of the Series. Mediapersons were left to jostle for space with the public and a photo journalist later alleged that he was beaten up by commandos protecting the cricket star. Amid the confusion, the start of the programme got delayed prompting former Indian captain to make a request for sanity to be restored. 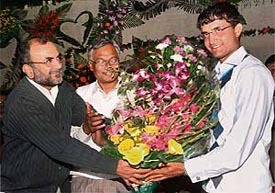 During the function, organised jointly by the Kolkata Municipal Corporation and the Kolkata Metropolitan Development Authority, Ganguly was presented bouquets by the Mayor and other dignitaries while a silver plaque was handed over to him by state industries minister Nirupom Sen.
Former Bengal cricketer Gopal Bose presented Ganguly with a photograph showing him jumping in joy after completing his first international hundred at the Eden Gardens during the second Test against Pakistan earlier this month. The citation, read out by poet Subodh Sarkar, described Ganguly as the “pride of the state” and recalled his months of struggle to return to the Indian team after being unceremoniously dropped in late 2005. “You have reached the pinnacle of success with your batting. We wish you before your 100th Test appearance in Melbourne on December 26. 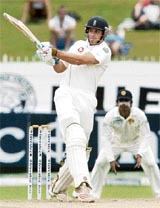 We congratulate you for scoring over 1000 runs in 2007,” it said. State municipal affairs minister Ashok Bhattacharya hoped many more runs will flow out of Ganguly’s blade in the coming months. In his speech, Ganguly wished success to all sportspersons of the state. “I have batted lower down the order for a lot of time and Rahul Dravid used to bat at number three and Sachin Tendulkar came at four. As a result, I had to bat at five or sometimes six and I missed quite a few hundreds because we did not have wicketkeeper-batsmen like Mahendra Singh Dhoni and Dinesh Karthik earlier,” Ganguly told CNN-IBN. “These guys support people batting at five or six. But me and Laxman suffered in terms of getting hundreds,” he added. The left-hander, who scored his maiden double hundred in the Bangalore Test and was the top run-getter in the series against Pakistan, said going up the order helped his batting in the just-concluded series. “I got to bat at number four in this series and it helped me,” he said. Ganguly felt his self-belief contributed to his fine performance in the Test series. “I had a good year before this series in both forms of the game. So the confidence was high. When I got a hundred in Bangalore, I was determined to convert it into a double,” he said. 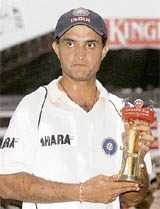 Ganguly aggregated 534 runs at an average of 89 and was deservedly declared the Man of the Series. This was probably one of the most poorly-prepared teams we have sent out on tour, and the results are an accurate reflection of the schematic and otherwise schism that differentiated the two sides. Shoaib Malik and later Younis Khan led out teams well below the standards we, as former Pakistan players, have set, particularly in a series against India. And while overseeing this critical encounter, one had to reconcile to the idea that overall India were the superior side. The biggest difference that seems to be underlined was India’s batting. This is a truly world-class batting line-up and almost all of the batsmen individually proved that to be so. In every match, incredibly they had someone to stand up and deliver when it mattered, and Sourav Ganguly’s fine displays in the Bangalore Test were just the icing on the cake. Contrary to this kind of coming together for the Indians, Pakistan were poorly served by their bowlers. In match after match they failed when it was most needed and for some reason — I am not sure why — it was assumed that two bowlers, Shoaib Akhtar and Danish Kaneria, would suffice for this powerful Indian batting line-up. In the event, Kaneria failed to do very much, while Shoaib was not fully fit for the full tour. On the odd occasion that he was duly fit he did test the batsmen, but there was no support for him at all. Umar Gul didn’t play a match, Mohammad Asif never even arrived after we were told that he would be here from the second Test onwards, while the others did as much as could be expected from them. In match after match, it was left to Pakistan’s batsmen to save the team. This they did manage to do twice in the ODI series, but when it came to the Tests, there was only one name to really remember, one sole model of resistance. Misbah-ul-Haq can hardly be called “promising” at 33 years of age, but he was one batsmen the Indian bowlers completely failed to work out. He truly had a tour to remember and looks set for a long stay in Pakistan colours now. Coming to India and conquering their conditions is never easy, but, to his credit, Misbah did that with great elan and success. In totality, India certainly outbatted Pakistan. Their bowling had more depth — Pakistan were at times reduced to three fit bowlers, as happened in Kolkata — and even in the field, India were marginally the better side. They can be proud of this achievement and a fine one it was too for Anil Kumble in his maiden series as skipper. Having said that, India now leave for Australia, and that will be a very different kettle of fish indeed. The pitches in all three Tests were well below international standard and certainly no advertisement for the game. In Australia things will be very different and the batsmen will very quickly have to make the adjustment. In their favour is the fact that this is a very, very strong array of talent, who have the additional benefit of having toured Australia. The Indian bowling and fielding however, can do with some amount of improvement. Against the Aussies, any team has to play beyond its potential and the Indian bowling did not really impress me in this just-concluded series. The fielding is almost as poor as Pakistan’s, and unless the close-in catching improves radically, it is not going to be easy. Most of all, I will again reemphasise the point about pitches. Preparing such tracks will not stand India in good stead abroad, and will probably harm their cause in the long run. If you travel abroad after playing a long series on such pitches, you may find yourself nowhere and will not be able to do much against teams like Australia. England’s batsmen shone under pressure to draw the second Test against Sri Lanka here today and keep their hopes alive in the three-match series. The tourists, needing to bat out the fifth day after trailing by 197 runs on the first innings, played solidly to move to 250-3 in their second knock by tea before rain washed out the final session. England now head for the final Test in Galle beginning on Tuesday seeking a series-levelling win after losing the first Test in Kandy by 88 runs last week. Alastair Cook, captain Michael Vaughan and Ian Bell hit half-centuries to keep the Sri Lankans at bay on a dead pitch where just 22 wickets fell over the five days. Sri Lankan captain Mahela Jayawardene, who was later named man of the match for his 195 in the team’s first innings total of 548-9, defended his decision to delay the declaration until after tea on the fourth day. “I don’t think even two days would have been enough to bowl out England in the second innings because the wicket was so flat and slow,” he said. Jayawardene, who surpassed Sanath Jayasuriya as Sri Lanka’s highest Test run-getter in this match, said he missed the veteran’s slow left-arm spin. Vaughan said he was delighted at his team’s ability to draw the game. “It’s one of the most comfortable draws I have been involved in,” the England captain said. “Normally we panic somewhere, but not today. We got through with some good batting and it has turned into a comfortable draw. The bowlers did well to keep running in on that pitch. Cook (62) shared an opening stand of 107 with Vaughan (61), their second successive century partnership in the match after putting on 133 in the first innings. Vaughan was the lone batsman to be dismissed before lunch when he offered an easy return catch to fast bowler Dilhara Fernando. Cook fell off the first ball after resumption, edging part-timer Chamara Silva to Mahela Jayawardene at first slip. Bell (54) put on 52 for the third wicket with Kevin Pietersen when he holed out against Muttiah Muralitharan, reducing the tourists to 204-3 midway through the afternoon session. Pietersen (45 not out) and Paul Collingwood prevented further setbacks to ensure the tourists emerged unscathed as heavy rain lashed the stadium during the tea break. Fall of wickets: 1-107, 2-152, 3-204. Bowling: Vaas 16-2-56-0, Malinga 8-1-37-0, Fernando 10-0-30-1, Mubarak 1-0-8-0, Muralitharan 27-5-58-1, Jayawardene 2-1-4-0, Silva 13-1-57-1. White lights and coloured clothing have illuminated one-day cricket and the most recent Twenty20 format, but the traditional five-day game with a history of 130 years have been spared from modernisation. “We are tossing it around and working out the fundamentals,” Cricket Australia chief executive James Sutherland said. “In a realistic sense, we don’t see any reason why we can’t be at least trialling some day-night Tests — not necessarily all of them — before the end of the decade. It could happen sooner, I don’t know. We need to explore that and go through a consultative process,” Sutherland was quoted as saying in The Australian. Within three years, Australia is preparing to trial day-night five day games. Officials are examining the possibility of scheduling games from 2 pm-9 pm or 3 pm-10 pm, saying that the move will allow more people to watch the cricket at the grounds and on television, according to the report. He also said the idea was not being driven by television rights holder Nine Network. Australia captain Ricky Ponting is not enthusiastic about the idea. “I was too aggressive while chipping for a birdie. And I repeated the mistake with an aggressive putt while trying for a par score. The end result was a double bogey on the last hole and the tied third slot in the JT Cup,” added Jeev as he relaxed at his Sector 8 residence here before flying to New Delhi yesterday afternoon. Back home with the 79th world ranking for 2007, Jeev said it was an average performance. His focus on winning resulted in bad management. The under-50 ranking in 2006 and the determination to do still better was telling on his performance on the US PGA and European Tour. The focus in 2008 will be on playing and not winning. His best performance came towards the end of the season on the Japan Golf Tour. He came very near to clinching the last event, the Golf Nippon JT Cup, after settling for the joint seventh slot in the Dunlop Phoenix 10 days earlier. He was playing well, but the focus on winning saw him executing aggressive chips and putts. His return to form towards the end of the 2007 season should hold him in good stead in the beginning of 2008 when he plays for the Royal Trophy between the Asians and Europeans on January 10. This will be followed by some big tournaments in the Middle East. He will concentrate next year on the European Tour. He will play more events on the Japan Tour, which has turned out to be a happy hunting ground for him. He will play in selected events on the US PGA Tour. Mallya said he had provided the engineering team everything needed for success and the target was pretty much clear. “I have given one very clear objective — at the 2010 Indian Grand Prix Force India has to be on the podium,” Mallya said. He admitted the team, formerly known as Spyker, was not in the pink of financial health when he acquired but said a podium finish in 2010 looked a feasible target. “I inherited a team that had lost its initiative, lost its enthusiasm — one that was struggling for its sheer survival. Everything was today and for today. Nobody looked at tomorrow and the day after, nor at 2008 or 2009, because nobody thought that they would survive that long. “I will give them a balanced budget to allow them the opportunity to carry out all the technical developments they want to do...They look to the future with confidence and when I tell them that in 2010 at the Indian GP we will aim for the podium they really believe that they can do it because they now believe that they will be there in 2010,” Mallya said on www.formula1.com. Mallya, however, made it clear that he was not there just to waste easy money. He sounded particularly confident about the car and said it was just a matter of finding quality drivers. “I think that the car always had a lot of potential but that the team in the past was not in the position to get more experienced drivers to show that potential, which we are now able to do. The liquor baron, however, made it clear that he was not into Formula One just to see the team lag behind. East Bengal took the lead in the 26th minute through Edmilson Marques. The Brazilian then had a golden chance to double the lead but he waste a penalty which proved costly as Okolie responded with three stunning strikes to snuff out East Bengal’s challenge. The Nigerian was declared the Man of the Match. East Bengal, who tried to make a comeback in the second half, reduced the margin through Mehtab Hussain in the 86th minute. The win took Churchill to nine points from five matches while East Bengal remained on seven after today’s defeat. East Bengal relied on counter-attacks and surged ahead in the 26th minute. Alvito D’Cunha worked his way on the left flank, relayed the ball to Edmilson who shot home on the run. Churchill equalised five minutes later. Churchill kept up the pressure and was awarded a penalty after defender Debabrata brought down Ogba Kalu Nnanna inside the box. Okolie made no mistake in finding the net. Two late goals by Karim Benzema added to an early strike by Sidney Govou in Lyon’s 3-0 victory at Rangers, which had needed only a draw to advance and knock the French champions out yesterday. Lyon advanced despite losing its first two group games, including a 0-3 defeat against visiting Rangers. Lyon advanced from Group E with FC Barcelona, which had already qualified but came from behind to beat VfB Stuttgart 3-1 with strikes by Giovani Dos Santos, Samuel Eto’o and Ronaldinho. It was Eto’o’s first goal in only his second game since his three-month layoff with a serious thigh injury. Fenerbahce trailed against CSKA Moscow after an own goal by centre back Edu, but turned the game around through playmaker Alex and two strikes by Ugur Boral. The victory means that it captured second place ahead of PSV Eindhoven, which tumbled 1-0 at home against Group G winner Inter Milan. After a barren first session, Air Force forged ahead soon after resumption through TTS Stephan. Twenty minutes later, they enhanced the lead through inside-left WP Singh. 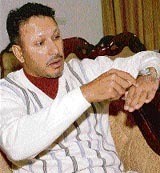 A minute later, Mughals reduced the margin through striker Shekhar Khanna, while Amit Rawat drew parity after 13 minutes. But the airmen were spared the blushes by substitute Manish Negi who found the mark during injury time. Runners-up Indian National notched up their third consecutive victory when they swamped Bangadarshan 3-0. Nigerian Anthony scored the first and third goals, while Lalit Rawat knocked in the second. Anand won the World Chess Championship to emerge the undisputed leader in the elite eight-player event held in Mexico City from September 12 to 30. Dola won the World Cup title in the women’s recurve event held in Dubai on November 24, defeating Choi Eun Young of Korea in a close finish. Dola’s victory also helped her earn a berth for the 2008 Olympic Games in Beijing. In the last match of the day, Jammu and Kashmir beat Jharkhand 3-2. Gurjeet Singh fired the first goal for J&K by converting a penalty corner, while Sartaj Singh and Devinder Singh posted one goal each. Nelson Topno scored both goals for Jharkhand.